Many of the resources required for recreating the fashions, activities and dances of the past are often difficult to find. The list below is of some of my favourite on-line (mostly) costume and vintage dance related sites, broken into categories: vintage sewing, vintage dance, and also a list with full contact information. Vintage Dance Related Links: Groups, musicians, suppliers, research sites. Suppliers List: with full contact information. 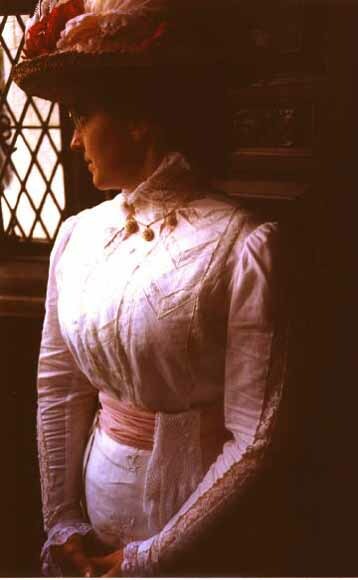 Period Fashions on-line Reference Library. The following list is a very short list of links to books, pattern companies, reproduction goods, fabrics, trims, and notions suppliers, antique clothing dealers, museums, and societies to aid you in recreating and enjoying the past. Visit my Vintage Dancing Links page for sites helpful for vintage dance enthusiasts. I am trying to keep my link lists short and easy to scan through but they get longer every day; there are so many good sites out there. Vintage Victorian publishes the Vintage Dress Series books, a library of period fashion resources, compiled from original period sources, to aid in the reproduction of period ensembles; perfect for vintage dancers, actors, costumers, brides, and historical reenactors. 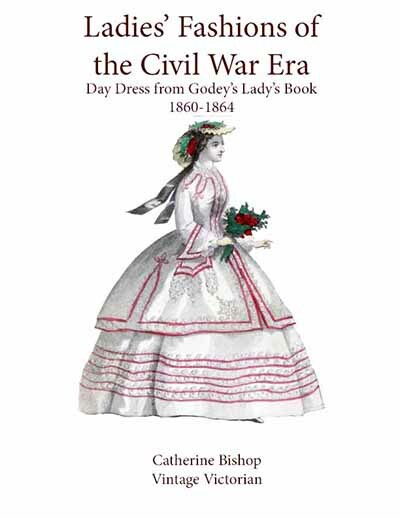 R. L. Shep Publications Books on authentic costume, fashions and uniforms from the Civil War, Edwardian, Federalist, Regency, Victorian and other eras. Authentic historic patterns and tailoring systems. Books on etiquette, customs, textiles, hats, corsets, sewing and needlework. Patterns of Fashion by Janet Arnold A series of pattern books by Janet Arnold, taken directly from ladies garments of the period, in 1/4 scale. An excellent, accurate, resource. LaBarre Books Authors and Publishers of Vintage Clothing Reference Books: 1900-1939, a series of five reference books on vintage clothing. Dover Publications Inc. Publisher of period catalogues, books, and costume reference books, has catalog, no phone orders, also available in most bookstores. Past Patterns Historical Pattern Company dedicated to accuracy. Publishers of 19th and early 20th Century patterns. Patterns from the Past Patterns from the Past sells original, vintage and some recently out of print sewing patterns of all kinds, and older knitting, crochet and tatting patterns. Folkwear Patterns Folkwear, founded in the mid-1970s, has a selection of sewing patterns based on vintage fashions and traditional ethnic costumes. State Historical Society of Wisconsin A line of historical patterns taken from nineteenth century garments. Harper House Vintage sewing patterns of many eras for the costumer, the reenactor and the hopeless romantic. Illustrated catalogue of vintage sewing patterns, hoop skirts, costume findings, reproduction needle art implements and books. Vintage Pattern Lending Library This library makes copies of all of their patterns, from the late 19th to the early 20th Centuries available (for purchase or loan). Sense and Sensibility Dress designs for lovers of Romantic fashions who want sensible clothing that fits nicely. All dresses created with period details and custom designed to suit your individual tastes, making each purchase unique. Ageless Patterns Reproduces patterns, mainly from Harper’s Bazar Pattern sheets, 1867 - 1915. Also carries some other pattern companies’ lines. Amazon Dry Goods Amazon Dry Goods has a new Owner! A supplier of a large array of patterns, clothing, shoes, and other items. Laughing Moon Mercantile Purveyors of Victorian sewing patterns for costuming and high fashion enthusiasts. Wm. Booth Draper Linen and Woolen Draper, Haberdasher &c.
Pattern Tracing Paper I like “Thumbnail” Soft tone sketch paper for Architects, Illustrators and Engineers. Most recently I’ve found 8 lb. white sketch (by Borden S. Riley Parer Co., Inc.), I found a 30 inch by 50 yard roll at an artist supply store. It is transparent and sturdy. I like to use Sharpie pens for tracing. Wooded Hamlet Designs Very accurate Cage Crinoline kit, and vintage related sewing supplies. River Crossing Inc. Source for authentically-researched Old West clothing. Michael J. Guli provides buckskin leather garments to historians, re-enactors, movies and television programs, museums and SASS members, while Sharon Guli hand-crafts Victorian corsets and ensembles. Jas. Townsend and Son, Inc. A mail order company that supplies 18th and 19th century reproductions for living history. Farthingales, Canada Farthingales, California Supplier of vintage related sewing notions and supplies, including corset supplies, has spoon busks. Thai Silks Imported silks from Thailand, China, Korea, and India and cottons from Indonesia. Oriental Silk Co. Imported silks from China. Their Kwon Chow silk satin if excellent for period designs where a lightweight satin is needed. New England Quilt Supply A wholesale quilt supply warehouse, fabric, notions, batting and more. Richard The Thread World wide distributor of corset supplies (Corset Busks, Hooks, and Eyes), costume supply-notions, fabrics including fine English coutil, and dress forms. Corsetmaking.com Offers corset making supplies, products, books, and services. Agelong Brands Maker of Faultless starch. No longer making powdered starch unfortunately. Lacis Offers an extensive selection of notions, books, tools and supplies for the textile arts to the wholesale and retail market. Publishes over 90 books relating to needlework and costume. J.R. Burrows & Company Historical design merchants. A great source for late 19th century reproduction fabrics, lace curtains, and wallpapers. Karen Augusta - Antique Lace and Fashion Offers for sale and auction, 18th Century through mid-20th Century museum-quality antique clothing, lace, and textiles. Antique and Vintage Dress Gallery This site sells antique clothing from the 1800s through today. Vintage Textile This site sells antique clothing from the 1800s through today. Charles A. Whitaker Auction Company Auction company which conducts regular vintage clothing and textile auctions. Vampalicious Vintage Vintage clothes for chaps and vamps. 20th century vintage mostly, nice menswear selection. The Costume Institute, The Metropolitan Museum of Art NEW YORK, NY. The Costume Institute houses a collection of more than thirty-five thousand costumes and accessories, representing five continents and seven centuries of fashionable dress, regional costumes, and accessories for men, women, and children, from the fifteenth century to the present. The MET also now houses the Brooklyn Museum Costume Collection. Dept. of Textiles and Fashion Arts, The Museum of Fine Arts, Boston BOSTON, MA. The MFA’s textiles collection, now housed in the department of Textiles and Fashion Arts, was started when Boston was the center of the US textile industry. Today the Museum owns more than 27,000 objects ranging from American needlepoint to European tapestries, Middle Eastern rugs, African kente cloths, and haute couture fashions. FIDM Museum and Galleries LOS ANGELES, CA. The collections of the FIDM Museum & Galleries span more than 200 years of fashion history. From Parisian haute couture to iconic film costumes, and one-of-a-kind accessories, the collections offer a comprehensive overview of fashion’s key moments and most important tastemakers. Fashion Department, The Victoria and Albert Museum LONDON, ENGLAND. Spanning four centuries, the V&A’s Fashion collection is the largest and most comprehensive collection of dress in the world. Key items in the collection include rare 17th-century gowns, 18th-century ‘mantua’ dresses, 1930s eveningwear, 1960s daywear and post-war couture. Plus a growing number of pieces from 21st-century designers. Costume Collection, Cincinatti Museum of Art CINCINATTI, OH. 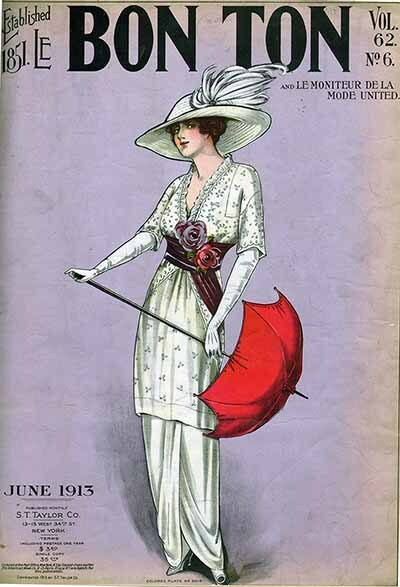 A colelction of historic fashions, publications, and exhibitions. The Museum of Costume, Bath BATH, ENGLAND. The collection focuses on fashionable dress for men, women and children from the late 16th century to the present day. The Museum of Costume was opened in the Bath Assembly Rooms in 1963. Musee de la Mode de la Ville de Paris PARIS, FRANCE. A collection of fashions ranging from the 18th century through contemporary, undergarment, accessories, prints & drawings, and haute couture fashions. Kyoto Costume Institute KYOTO, JAPAN. Has a vast collection of costume from the early 18th century through the 20th century. great on-line collection. Les Petites Dames de Mode PINTEREST PAGE. John Burbidge has made a collection of 29” high dolls dressed in period clothing, 19th and early 20th century, there is no permanent gallery, but they are displayed in exhibitions throughout the country. The Museum at FIT NEW YORK, NY. The Museum’s permanent collection encompasses some 50,000 garments and accessories from the 18th century to the present, focusing on aesthetically and historically significant “directional” clothing, accessories, textiles and visual materials, with emphasis on contemporary avant-garde fashion. FIT list of online costume databases A listing of online costume databases around the world. Online Fashion Engravings Database at the Bibliotheque des Arts Decoratifs The massive online fashion engravings database at Les Arts Decoratifs in Paris is a wealth of inspiration for men's and women's fashions spanning the 18th, 19th and 20th centuries. The sheer volume of information, and the fact that it is all free, makes this one of our favorite online resources. Be prepared to spend hours! 1. Click on this link to the database. 3. In the "Termes de Recherche" box, enter the word Mode. 4. In the "Documents numerises" section, select "Album Maciet". 5. Click "Rechercher" at the bottom of the page. 6. Select a collection to view by ticking the box, then click on "Voir les Notices" at the bottom of the page. The collections are organized chronologically. 7. This will pull up the information for the book you selected in a box to the right. In that box, click on ”Voir les vignettes Maciet“. 8. Click on any thumbnail image to view the larger image. 9. Click on "Impressions" to save or print the image. The Costume Society of America The Costume Society of America "advances the global understanding of all aspects of dress and appearance." The Costume Society UK The Costume Society (United Kingdom) "Promoting the study of all aspects of clothing and textiles, the Society aims to encourage access to costume history, including contemporary dress. Our appeal is wide-ranging and object-based. Our members include academics, collectors, curators, designers, re-enactors, students and informed enthusiasts across the world." Costume College 2015 Costume College, Woodland Hills, CA "Costume College© is an annual three-day costuming arts conference produced by Costumer’s Guild West, Inc. Offers lectures, workshops and demos on all things costuming." Costume Con 2015 Costume-Con is an annual convention dedicated to the art and craft of costumes and costuming of all types. It features classes, displays, a fashion show, masquerades, and other competitions. Costume-Con 2015 will be in Charleston, SC, May 2015." Vintage Dance provides an excellent opportunity to use and appreciate reproduction Vintage Clothing. During the 19th Century dancing was one of the few social pastimes available. Many teach-yourself dancing manuals exist from this period, and a thriving Vintage Dance community exists to recreate the dances and social customs of that era. I belong to The Commonwealth Vintage Dancers, a dance troupe that performs a number of dances of the 1860's, 1890's and Early 20th Century. A dance troupe based near Boston; performing troupe and sponsor of balls, workshops and sponsored the Newport Vintage Dance Week for 25 years in Newport County, RI in August. Each Summer, Vintage Victorian hosts the Nahant Victorian Dance Weekend each summer. Vintage Victorian publishes books on authentic costuming for reenactors as well as for vintage dancers. .
A dance troupe directed by Marc Casslar and based in Hartford; sponsors Balls, performances and other Vintage Events throughout the year. Moments in Time sponsors regular dances, both formal and informal in the Hartford area, including the annual Holiday 19th Century Ball in December. They have recently partnered with Senexet house (Woodstock, CT) to host vintage events and retreats throughout the year. Located in Cape May. Sponsors two vintage dance workshops each year, one in April and another in October during their Victorian Week events. Dance troupe based in and around Philadelphia, directed by Bob Skiba, researches, performs and teaches American dances from the colonial period all the way up through the 1940s. A dance troupe based in and around Cincinnati; sponsor of vintage balls and workshops throughout the year. Grand Traditions Vintage Dance Academy, founded in 1990 by Arlynn Hacker in Ann Arbor, invites you to experience vintage dance. Offers workshops and balls, focusing on dances from the mid-19th through mid-20th centuries. The Lexington Vintage Dance Society, with headquarters in Lexington, is dedicated to researching, teaching, performing, and promoting the ballroom and social dance forms of the 19th and early 20th centuries. A performing troupe based in Palo Alto, (near Stanford) under the direction of Eduardo Maragliano and John Beale. A not-for-profit organization dedicated to the lively exhibition of 19th and early 20th century social dances. PEERS (the Period Events & Entertainments Re-Creation Society) is a vintage music and social dance organization in the San Francisco Bay Area that hosts period balls and dance classes, generally set in the 19th and early 20th centuries. The Social Daunce Irregulars have been presenting Victorian Balls in the Pasadena area since 1988. they are dedicated to keeping the tradition of the 19th Century Grand Ball alive in an otherwise gray and pedestrian world. The Bay Area English Regency Society is a vintage music and social dance group in the San Francisco Bay Area in California. Holds monthly dance parties and several period fancy-dress historical balls throughout each year. A social dance group located in San Diego; an affiliate of the Lively Arts History Association, present a variety of vintage dance events every year. A dance group which runs historic dance events. The ensemble HOF-DANTZER, led by Hannelore Unfried, based in Vienna continues the tradition of the golden age of Viennese dance culture. Host of the Vienna Vintage Dance Week in February. Vintage Dancing isn't only done in the US and Europe. Earthly Delights provides a host of vintage related links including dances, music, and costuming. They also have a list of Upcoming Events you might be interested in if you are in the Canberra region. Spare Parts On piano and flute, Bill Matthiesen and Liz Stell play a variety of dance music, including romantic couples dances, contra, and English Country, as well as historically accurate programs for Regency, Victorian (mid-nineteenth century through 1890s and ragtime dances. Argentine tangos are a special interest of theirs. Their CD entitled The Civil War Ballroom is ideal for recreating a Victorian Ball. Ian Whitcomb America’s Foremost Tin-Pan Alley Man, Ukulele Virtuoso, and Grammy Award-Winning Recording Artist. Ian Whitcomb has been entertaining the world for over 30 years. Hitting the American Top Ten charts in 1965 with his novelty record, “You Turn Me On”, he soon abandoned life as a British Invader (born in Surrey, England, in 1941) to devote himself to resurrecting the roots of pop music, especially Ragtime and the simple, heartfelt songs of turn-of-the-century Tin Pan Alley. The New River Dance Orchestra provides period dance music for Victorian and Ragtime Balls, their speciality is the music of the Ragtime and Early Jazz eras. An American Ballroom Companion presents a collection of over two hundred social dance manuals at the Library of Congress. 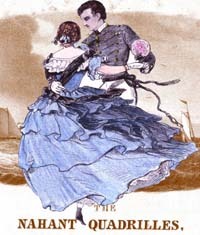 The Dance Card Museum is located at 152-154 Spring Street, Newport, Rhode Island. Vintage Dance Images Vintage Dance Images are reproduced from wonderful antique dance postcards and piano sheet music, most from pre-1920. Dance Card Pencils There is once again a supplier for dance card pencils ($5.40 per dozen).